The Iron Orc Nirncrux Mines are five mines in Upper Craglorn. They consist of an open area guarded by three trolls, although large groups of Iron Orcs will begin to pour out of the mine entrance once you attack. Groups must hold off the attackers and kick the three barrels of kindle to collapse the mine and summon a Troll Colossus. Surviving the event will reward your group with a treasure chest and access to Stable Nirncrux, which can be activated to receive the Nirncrux Infusion armor buff for 15 minutes. Since Update 12, they have been categorized as Group Bosses, with each one having a unique name. 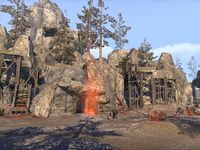 Before then, they were listed under Group Events, each as an "Iron Orc Nirncrux Mine". This page was last modified on 8 April 2017, at 20:17.